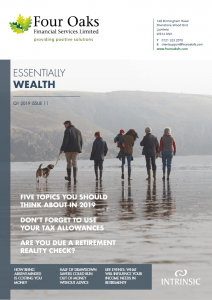 We will be emailing the latest issue of our Essentially Wealth magazine to our client in the next few days, but you can read it here right now. If you would like to receive this via email and are not on our mailing list please contact clientsupport@fouroaksfs.com. In this issue read about how being absent-minded is costing you money and, an article on the “B” word and your finances.